We are a developmentally-based art program for children as young as eighteen months to adults. At our studios, everyone is an artist. We seek to build creativity as a life skill that will serve our students beyond the art studio. Our job is to bring the materials and methods that help students tap back into a primal maker self, a joyful artist who believes she or he knows how to make a thing of beauty. The above paragraph is an excerpt from our teachers’ textbook, Scribbology, an in-depth examination of the philosophical underpinnings and origins of Scribble that serves a guide for teacher training and reflections on teaching practice. But what are these terms? And more importantly, as Scribble seeks to transform art education as most of us have experienced it, how can we redefine and reclaim these definitions of artists, beauty, good art, good art teaching? What is a DEVELOPMENTALLY-BASED art program? Teachers have long established that the sweet spot of teaching comes in meeting children within what cognitive psychologist have termed the "zone of proximal development." Or, as Goldilocks said it best: not too hard and not too easy. Our curriculum is designed with just enough challenge to keep our artists engaged while minding the parameters of their development. They’re successful but not bored, challenged but not frustrated. Moreover, they comprehend and feel ownership of their process, and in turn, their product. What does that look like in our studios? We don't ask toddlers to make representational work. Instead, we ask them to fully explore one material at a time and one project per day, a gradual of widening their attention span. We don't ask six year olds to draw in perspective. Instead, we ask them to explore the possibilities of line and shape using a multitude of materials so that they can understand line and shape. We take the long view of their artistic growth, recognize it on a continuum, and give our students building blocks for the next stage. Perhaps our biggest hurdle as teachers, artists ourselves, and as a company, is that the word artist has come to mean a freewheeling beret-wearing guy (or girl) who paints accurate representations of fruit, landscapes, or people. Society applauds our children for mimicking the masters and for drawing pictures that are conventionally pretty, but at the cost of losing the true definition of an artist: a hardworking problem solver who seeks to realize an original idea. At Scribble, originality and hard work are the foundation of the creative spirit, and we know (and so do the researchers at Harvard's Project Zero who have studied artist behavior within school studios) that what makes an artist is cultivated habits of mind, and that these habits are teachable. How is EVERYONE AN ARTIST? creativity is: if you cook, you're creative; if you've juggled your own schedule with those of two children, you're creative; if you've sung in the shower, you're creative. Humans are the only animals who create objects, music, who dance only for the sake of pleasure. It's in our DNA. It's less likely that you are not an artist and more likely that you didn't have a good art teacher, one who didn’t reframe creativity as problem solving and perseverance and intentional coloring outside the lines. Beauty in artwork is complexity, it's evidence of an artist’s time and attention and intention. It's not a sun in the corner or a rainbow coming up from the ground or a puffy blue cloud drawn in the sky. Why not? Because these symbols didn't require thinking outside the easy. Beauty is finding paper clips on the ground and building a sculpture with them, drawing a creature with a toaster as a head, drawing yourself with every tooth. Beauty, and good art, is about the effort you put into making your work interesting and different. It’s about your point of view. We emphasize the artistic process over product and encourage our young artists to develop their own perspective and approach because we believe that what they have to say is important. Our children are encouraged to create through experimentation. We give students choices and encourage decision-making, risk taking, innovation, and agency. We pose questions throughout the process in order to develop curiosity, problem solving skills, and critical thinking. Projects are challenges with multiple solutions. 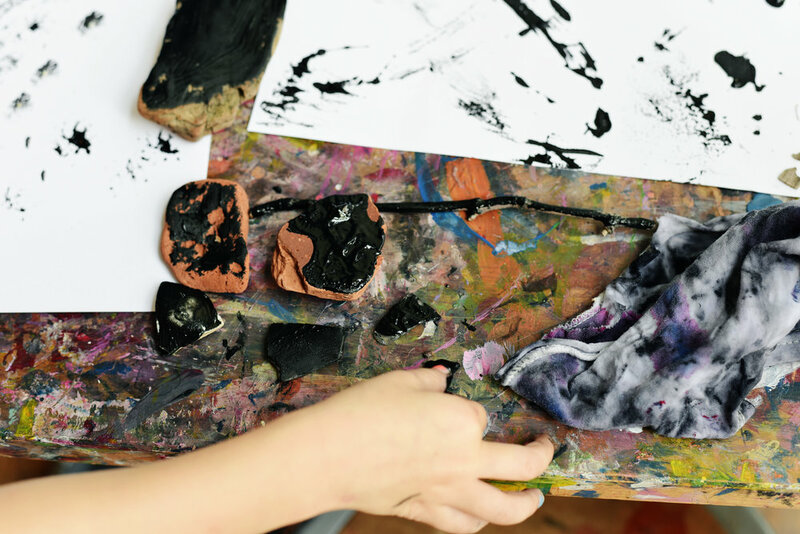 By making art, looking at art, talking about art, and exhibiting art, students form connections between what they make and how their work impacts the world around them, all the while developing their visual literacy, verbal language, and fine motor skills. We teach our students they are artists who posses the capability to shape the world around them, to change perspectives, to take action, and to understand that everything they do can have an impact. Scribble students hone the skills it takes for an artist to take an idea from conception to fruition. They develop ownership over their work and artistic vision. They not only see the world through the eyes of an artist, they practice and engage in artistic habits of making, thinking, and reflecting. David is a globe-trotting serial entrepreneur with a lifelong passion for the arts. Lizzie joined the Scribble team in 2015 after nearly 15 years of working in museums both great and small. Sioux came to Scribble via two paths: a lifelong love of art and art-making, and her kids! Born and raised in Tokyo, Japan, Hana received her BFA from the Art Institute of Boston at Lesley University and her MFA in sculpture from the New York Academy of Art. Ivory Nunez Medrano is an illustrator and graphic designer born in Santo Domingo, Dominican Republic. Born in Mexico City, Alonso is a painter who works from observation, often depicting his everyday surroundings and experiences. At College of the Atlantic in Bar Harbor, Maine, Alonso learned the techniques of traditional landscape painting. Maggie's parents say she used a paint brush before she could even sit up as a child. Chloe started drawing, painting and making collages at an early age and was lucky to have some incredible art teachers all throughout school. Born in Chicago, Alex is a mixed media artist based in Brooklyn NY. Alex’s art deals with both intuitive play and methodical or appropriative practices. Sarah has been working with children for over a decade. For years, Sarah worked as a professional nanny, working with a variety of childcare providers. Mini Scribblers are encouraged to use materials in multiple ways that help them to understand the possibilities and the limitations of those materials. Toddlers understand and learn through touch. We encourage them to fully delve into each material. We check in with our Minis to ask “how does that feel?”, encouraging them to build a language for describing these novel experiences. Toddlers have very short attention spans but also a strong desire to play with art materials. We harness this to develop their patience and focus (how long they will endure “the wait” for something new) and lengthen their attention spans (how long they’ll stick it out with what they have). Toddlers are sponges for language and we take advantage of this at Scribble. We give them tons of vocabulary and encourage our artists to ask for materials when they want them. Our curriculum is developmentally based and taps into innate toddler behaviors. Enjoy making art in a space built to celebrate what a toddler instinctively wants to do without creative boundaries. And where, of course, you can draw on the floors. If you have smelled, dipped, and practically swum in paint, how can you not understand its possibilities? We begin to talk about what we see in each other’s artwork, building foundational language for future discussion. We ask Pre-Scribblers to notice lines, colors, shapes, and and to identify the artist’s process through close observation of the finished artwork. With no parents present, the Pre-Scribbler studio is the first opportunity for these artists to create their own ecosystem. Pre-Scribblers help set up materials, clean and care for the studio, and work on taking turns and respecting each other’s needs and wants. All projects in Pre-Scribbler classes take at least two sessions and combine various materials. Pre-Scribblers are challenged to explore how materials work (or don’t work) together. While traditional education seeks to guide students towards one convergent answer, we encourage our artists to explore multiple answers to one question, often pertaining to a unique use of a new material or method. At this age, process and product carry equal weight. We encourage our artists to critically consider their process through product, reflecting on how their choices impact the experience of the viewer. Our Scribblers work alongside each other with the teacher as the facilitator. Our artists learn through doing and by discussing these actions with their peers. Each artist finds his/her voice within the studio group. Scribblers identify as artists and work somewhat autonomously within the studio to express his/her needs or wants for their work. Forget everything you know or imagine about a “kids’ art exhibit.” The Scribble exhibit features professionally framed pieces of work curated and hung by our working artists of all ages in grand New York City venues. Pieces are sold by 7-10 year old dealers or through live auction by 7-10 year old auctioneers and all proceeds sponsor kids to take our classes at no or a reduced cost. Why? Selling their work is a part of the artistic process and an experience we feel is essential for all young artists. Through letting go of artwork, artists more freely embrace risk-taking. With the knowledge their work has value and even more, that its monetary value can help their peers who are less fortunate, Scribblers learn the power of their work within a larger context. We started taking our son to class at 18 months old and Scribble has been a part of our lives ever since! Its not just a place for "art class", its a community where our children are encouraged to color on the walls, get messy, touch and explore textures and materials, make their own art supplies, draw out of the lines (if there even are any lines) and really discover the world of art. With two kids at Scribble - one age 2 and one 4.5 - we can’t say enough about this organization. All the teachers are incredible with our kids - its the first place we could ever leave our daughter for “drop-off” because she loves them so much. At Scribble, our kids get to do so much - they measure, mix, spray, shake, feel, roll, drop, squeeze, grow, love and learn. We are so lucky. "Scribble has been a part of our family's life for four years." When my daughter was in Kindergarten, we needed to find a safe and nurturing after-school environment for her. We were also looking for a place where she could let her "out of the box" creativity flow. When I told her that there was an edible art class, her eyes lit up. Throughout the years, when I tell people that my kids do printmaking, graffiti, woodworking, xylophone, yoga, and so on, their jaws drop. And it's not just about the classes. The thing that makes Scribble/Bread and Yoga so special is the wonderful community--caring educators and respectful youth coming together to help and encourage each other. Listen in at the end of a class and you will hear students share their work in a gallery setting while the rest of the group gives feedback and suggestions. As a public school educator and lover of the arts, I highly recommend Scribble's programs. "Scribble Art is by far my daughter's favorite activity." The small, engaging, creative classes provide a supportive space for her to enjoy and explore art. I am not only amazed by the pieces she brings home, but also by the way she describes the process and experience of making them. "Scribble Art Workshop is the art studio of my childhood dreams and now as a parent and an artist myself I get to make that dream a reality for my two young, super creative and curious kids." I instantly connected with Sasha when I took my then two year old son to a mommy and me class just one week after moving to the Rivertowns. A friend told me about the amazing work that Scribble was doing in our community and when I walked in I knew this place was the real deal and that I had met a kindred spirit. I love the Scribble philosophy that all people, not just children, are artists and have the capacity to be creative. At Scribble my kids are encouraged to think outside of the box, to not be afraid to take risks with their art making, and most importantly to have fun and to enjoy the process of making art from first getting their idea to sharing and talking about their work with their peers. Stretching your mind, being creative, making art and being an artist are magic and Scribble really gets this! I really love how the teachers emphasize that there are many ways to solve a problem, that all solutions deserve respect and attention, and that their work is important and impactful. My kids are excited to go to Scribble (the space is so bright and beautiful and inspiring), to talk about their art and all the fun things they're learning from their incredible teachers, and they're excited to make art at home - all things that bring me so much joy as a creative person and mom. "Scribble has become such an important part of our lives in Dobbs Ferry." The teachers are caring, thoughtful, and true champions of all of the children in class. They are focused on the child's experience and the process of making -- yet somehow the work that comes home is astounding (and frame-worthy)! We love Scribble and are so lucky to have their studios, teachers, and events right here in town. I can't recommend it enough! "Scribble Art has become such an important part of my family." Our journey began with art classes when my son was just 20 months old. I loved watching him create and play with new materials and bring home fabulous works of art! This past year, my now almost 3-year old attended Too Cool for Preschool. It is incredible to see the love he has for his teachers and his school. He attended just one day a week and I swear he loves them as much as he loves his parents! Scribble teachers are the best. I never once questioned my son's happiness or safety while he was at school. Both drop off and pick up were always filled with smiles and excitement. I have no doubt that Scribble Art is the perfect choice for my family. Looking forward to the next school year! "We are so grateful for Scribble!" Our three children - now ages 9, 7, and 5 - have all had the wonderful opportunity to learn from and with Scribble for most of their lives. We took our first Scribble art class when our eldest was about 18 months old, and I remember being captivated by Sasha's warm, personable, direct connection with the children. She, like the rest of the Scribble teachers, speaks to the children as people, never speaking down to them like "babies", and makes each child feel valued as an artist and empowered with a new means of expression -- art. It has been a joy for me to see each of my children experiment with and discover their own voice as artists, and all three continue to thrive in Scribble programming even today. Julianne is an absolute gift -- her enthusiasm for her projects is contagious and is matched by her deep commitment to the students. She creates a warm, safe environment in which our children can play and learn, and we feel very lucky to have her in our children's lives. We are incredibly grateful to and for the wonderful staff at the Inwood Scribble Art Studio. My 5 yo son Noah has always been into art so when he had his last birthday, we searched all around and found Scribble. We had an amazing party there and quickly after, joined regular classes. He has such a wonderful time in class and loves his teacher Emily. She is so caring and talented and works in an amazing way with the kids. Plan to continue at Scribble for many years to come. "The works by the two dozen 'Mini Scribblers' is not paint-by-numbers hackery, but bona-fide paintings"
For example, the youngsters used their hands, butts and limbs as brushes producing “Body as Art Tool” - a four-panel piece with echoes of Rothko. The tots also produced “Drip, Drop & Pour,” a triptych reminiscent of Jackson Pollock, albeit with a wider funnel. No matter how much money it goes for, it’s art. There is now art in everything...a mound of sand at the park, an empty cider jug, and the soup we make for dinner. The workshops have informed the way they express themselves, communicate with friends, and problem solve. They have kept our family growing, discovering, and celebrating. Baths are sillier, walks are more wondrous, and conversations are more textured. Thank you for not merely being a center for arts education, but striving to educate our children through the arts. "The best young-artist incubator in NYC"
I first observed Sasha in action when I brought my daughter to a miniscribbler art class. Sasha impressed me so much with how she worked improvisationally with the kids--she embraced whatever was being offered by them and worked with it, rather than imposing her own agenda upon them. And she managed to do this while still keeping a sense of authority and steering the ship. This philosophy is behind all the Scribble Art Workshop classes and has given my daughter a sense of empowerment, which is probably why at age two she enthusiastically tells me, "I love making art!"